You are here: Home / All Recipes / Let’s Do Breakfast! I found the candy drawer at work today. I would have had a fun size bag of Skittles, but the bag was close to empty. I ate a Cow Tale instead. A caramel cream candy like thing if you aren’t in the know. I like working with people who stash candy and chocolate in desk drawers. I trust people with sweet tooth’s. I am a little leery of those lacking one…just a heads up. Speaking of sweet teeth. How many cups of hot chocolate is too many in one evening? Please don’t say 4 or more. Please. I am not making fancy hot chocolate. It is out of a packet. But with milk. So it is a little bit fancy. Almond milk and coconut milk make freaking fantastic hot chocolate. Not a big surprise…almond and coconut pair perfectly with chocolate. And they are so creamy. So this evening, or last night actually…I had hot chocolate with my breakfast dinner. Because who doesn’t like breakfast for dinner? I know some of you don’t and truthfully, I am not too sure of you. You can join the non sweet tooth people above…you are forever in my leery category – I am keeping a non-creepy eye on you. Breakfast for dinner. I have this more often than not…it is easier to make breakfast for one. Plus you aren’t left with a week full of leftovers. Plus, eggs…well they are super healthy for you. The closest thing to a complete food you can find naturally. An amazing little nugget of goodness. How do you like your eggs? It is like coffee or bacon…you have a preference. With cream, extra crispy, and well…I love eggs any which way, just not raw. I think that is a given. Right? 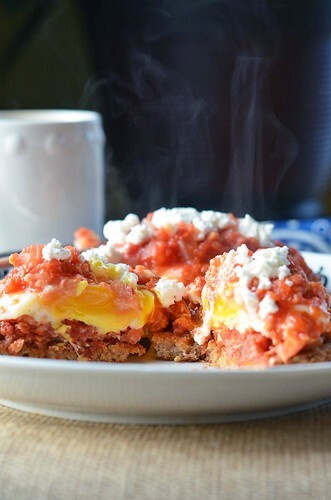 Scrambled, poached, hard boiled, over easy…any which way. Last night, I chose poached. 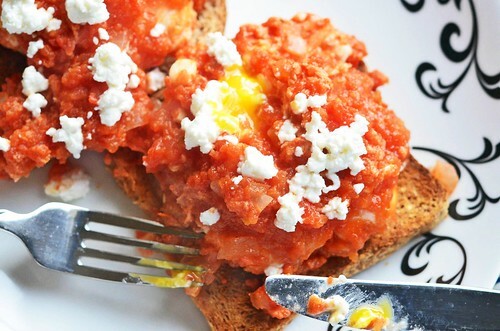 Poached in a tomato sauce and topped with crumbled goat cheese. Creamy goat cheese. And then I chose the same for breakfast. 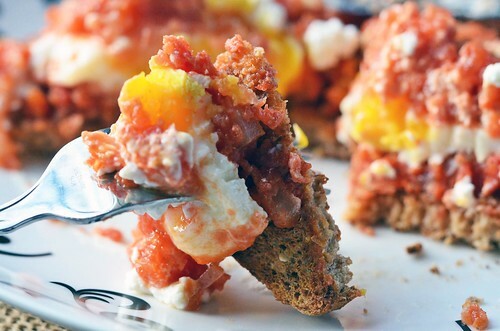 But for breakfast I layered this all on two slices of hearty wheat bread. With coffee this morning, not hot chocolate. I beg of you to try this. In a skillet over medium heat, warm the olive oil. Add diced onion and minced garlic. Cook until onion is translucent and soft. About 5 to 10 minutes. Add tomato sauce, salt, pepper, red pepper flakes, and sugar. Stir to combine. Bring to a boil and then reduce temperature and let simmer for about 10 to 15 minutes. 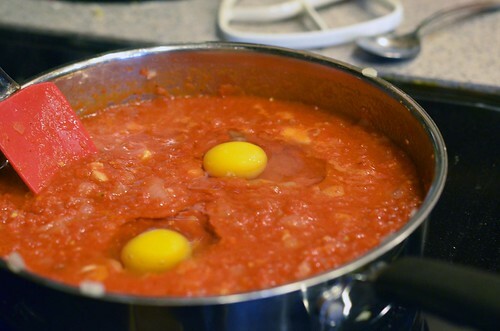 Gently crack eggs into simmering tomato sauce, cover (I used a cookie sheet), and cook for about 5 to 7 minutes or until the egg whites are set and the yolks are still runny. Remove from heat and let sit for several minutes before serving. Place 2 slices of toast on each plate and gently transfer one egg to each slice of toast. 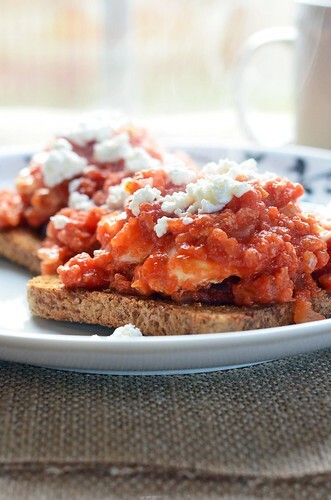 Spoon tomato sauce over eggs and toast and sprinkle with goat cheese.